I have a lot of cards sitting on my desk. A lot. Cards manage to find their way there when I get stuff in the mail, but stuff at shows, open packs at trade night or just do some random cleaning of my closet. I'm literally looking around my desk right now and see cards that have just been sitting for likely a year. I don't know why I can't keep things more organized.....or don't. Somehow it just feels comfortable to have cards sitting out in my office. Every once in a while I'll flip through a pile and think "oh yeah....I remember that one." Most of the time I forget I even had the cards on the desk to begin with. That said, when it comes to my various collections.....those get the organized treatment. Rarely will I let a pile grow of more than 6 or 7 cards like my Lindens or goalie masks. Those get documented and put away pretty quick. When I was sifting through one of my random piles a couple weeks back, I noticed a trio of cards that I knew I wanted to share for their unique photos. So here we go. This cards screamed out at me for two reasons. 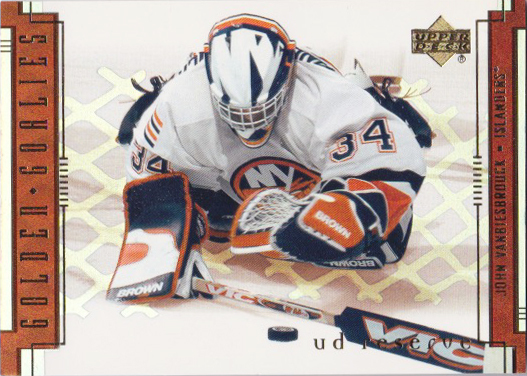 I love the mask Beezer is wearing here (a very underrated Islanders offering). He's known for some pretty iconic masks but this one gets overlooked easily. I also like this card because it shows the top of the mask and the clear 'NY' that is automatically associated with the Islanders. 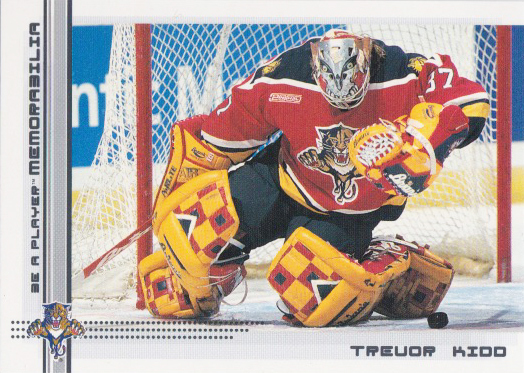 As you all know by now, I like my goalie mask cards. I like goalie masks period. So it's nice to see a part of the mask get photographed that normally doesn't make the cut. I feel like the crown of the mask and the backplate are the two areas that get little hobby love. Shame. Remember when Topps used to do hockey cards? Remember when Marc Denis played in net? Remember his mask? This perfectly framed horizontal offering is one of my favourite cards. I love the pic of him just gobbling up the puck. His monstrous equipment drowning out the background just creates the feeling of action....yet somehow time stands still when I see this pic. Heck, I like his mask so much I feel like doing a 'Rate My Mask' for him (remember those posts?). Heck again, after seeing this piece of cardboard I feel like starting a little mini collection of crown mask photo cards (clearly I would have to come up with a better title than that). 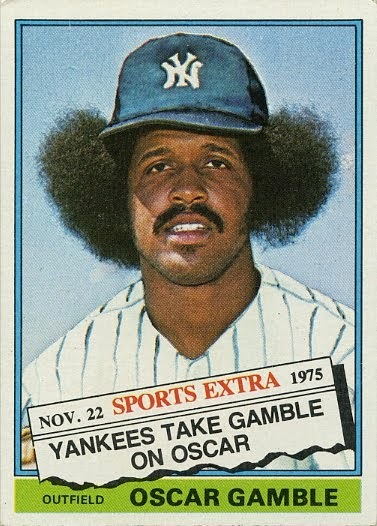 A card like this really gets my collecting juices going. When it comes to design and flare, Trevor Kidd might just take the cake. His pads, his masks, his hair, he's never one to be boring. It's cards like these that make me go "Oh yeah....he played in Florida." It was the third of four stops in his NHL career. In looking at his stats, he had a very lacklustre career (from what I thought he had). Clearly the hockey card industry was stronger for Kidd than his actual play on the ice. I don't even know what's going on with Kidd's mask but the metallic, robotic motif clearly says Florida to me. But I always got the sense he was a guy who preferred the road less travelled. So what do these three cards have in common? Puck gobbling, horizontal layouts, mask crowns and early 2000's explosion of goalies. What's not to like about that? Have you come across any others that would fit this description? What goalie mask crowns catch your eye? It's been awhile since I've sat around and sifted through my hockey cards, so I haven't found any crowns lately. Love yours though.